The House of Trolls is a former farm whose history dates back to the seventeenth century. Westhouse located in close proximity (2km) from the expressway leading to Strasbourg (25km), Colmar (25km) and Colmar (35km). Obernai is distant from 15km. The village is a quiet village of the plain of Alsace, the Farmers' Street is known for its beautiful and imposing framed houses. You will find all the amenities within 4km. The house is a family home that we have been keen to renovate much of ourselves. In the summer, it opens on one level on a beautiful outdoor space while in winter it is centered around the wood stove in the living room (complement the floor heating, it is only for the pleasure of the heat wood!). La casa está muy bien ubicada. Está cerca de muchos pueblos y muy bien comunicada. Se puede dejar el coche dentro de la propiedad. La vecina nos regaló unas pastas. Muy amable. El propietario dejó una serie de instrucciones encima del extractor de la cocina con la clave de la wifi y otros consejos. La casa no pone toallas. Nosotros no llevamos, después de mirar muchos sitios, pensamos que si por error. El propietario nos proporcionó unas. El sitio es muy tranquilo. Wir waren auch nach mehreren Tagen noch fasziniert von den Kleinigkeiten und Besonderheiten, die sich überall im Haus verteilt finden. Wir alle, auch unsere 3 Kinder, haben uns diese Woche sehr wohlgefühlt. Schade, dass der Bäcker genau in unserer Ferienwoche geschlossen hatte. Vielen lieben Dank nochmals für alles. Traumhaftes Haus. Und sehr nette und umsorgende Vermieter. Wir können es nur an alle empfehlen, die sich für diese Region entscheiden. Das Haus war super, sehr schön renoviert und gemütlich eingerichtet! Gute Küchenausstattung (sogar mit Crepes-Eisen und Raclette) und nette Gastgeber! Maison fonctionnelle, accueillante, avec tout le confort nécessaire. Des hôtes à l’ecoute, disponibles, et charmants. Dans un village typique. 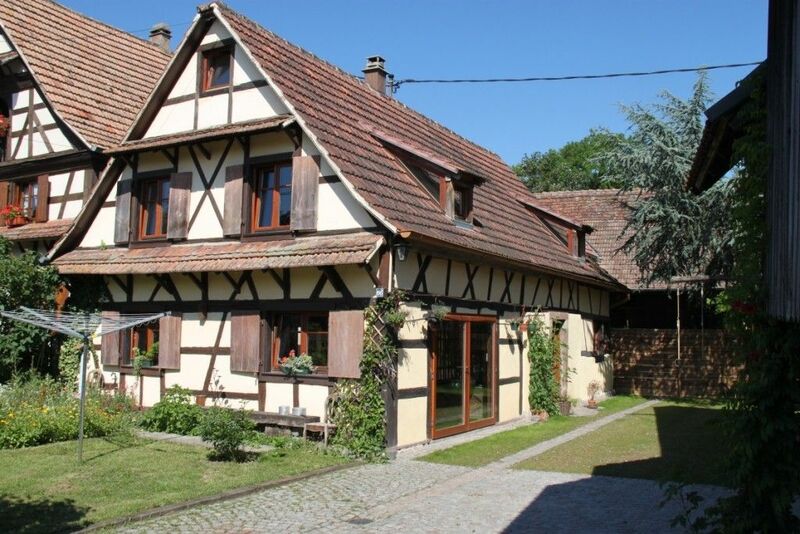 Westhouse is a pretty village of Plaine du Ried, located equidistant from Strasbourg and Colmar, a few miles from Piedmont des Vosges in the west and the Rhine forests in the East. To see in the region of Sélestat: the Humanist Library, medieval castles, the High Koenigsbourg, the Wine Route and wine trails, the Grand Ried of the Ill wildlife and protected flora. Les locations s'effectuent du Samedi 16h au Samedi 10h. Le tarif s'entend charges comprises, hors taxe de séjour. Le linge de lit est inclus, le linge de toilette est à apporter. Le ménage est facturé 50€, à annoncer lors de la location et à régler sur place avec le solde. La caution est à remettre à l'entrée, et sera rendue à la sortie de la Maison.